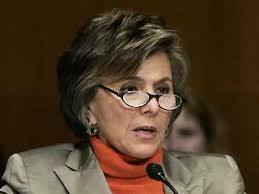 Fiorina made a comment about Califorina Senator Barbara Boxer’s hair…. But the media loves ‘open mike’ ramblings…..
And love reporting ‘open mike’ ramblings….. In one of those classic campaign gaffes,Carly Fiorina, the Republican nominee for the Senate seat held by Barbara Boxer, the California Democrat, was caught mocking Ms. Boxer’s hair into an open microphone on Wednesday. She also had a few tough words about the newly minted Republican candidate for governor and her B.F.F.-on-the-stump,Meg Whitman. Ms. Fiorina’s comments were, all told, really no more incendiary than a bit of warm pasta salad — who hasn’t indulged in some off-the-record chitchat about the grooming habits of others now and then? But they presented her with a political problem that could haunt her throughout the campaign. They both inform and confirm the image from her days as chief executive at Hewlett-Packard that she is tart and unpleasant. And they open the entire campaign to perceptions, however tired or unfair, that women can be dragged down the road of pettiness, perceptions that detract from the serious and pressing issues of the day. “The fact is that some voters, including many women, find this interesting and no doubt form their character judgments on such matters,” said Bruce E. Cain, a professor of political science at the University of California, Berkeley. 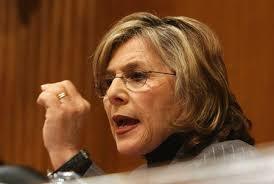 Senator Boxer saw an opening, and took it. “Let her talk about hair; we’re talking about jobs,” said Rose Kapolczynski, her campaign manager. Video of the episode shows Ms. Fiorina waiting to be interviewed by a Sacramento television station, scrolling through her BlackBerry and asking a staff member why Ms. Whitman would want to appear on Sean Hannity’s show on Fox News, which she deemed too tough an interview. Then, after commentary on the passion for hamburgers shared by her husband and male staff members, Ms. Fiorina somehow pivoted to the locks of her Democratic opponent. “Laura saw Barbara Boxer briefly on television this morning and said what everyone says, ‘God, what is that hair?’ Soooooooo yesterday,” Ms. Fiorina said, scrolling, scrolling. Things have really gone wrong quite a bit in some KEY SENATE RACES over the last two weeks. In California former Hewlett-Packard MORON screw Candidate Carly Fiorina (R-CA) appears set to win the Republican Primary over former U. S. Rep. Tom Campbell (R-CA) and State Representative Chuck DeVore (R-CA) presenting Incumbent Senator Barbara Boxer (D-CA) her Re-Election on a SILVER PLATE. and 3. 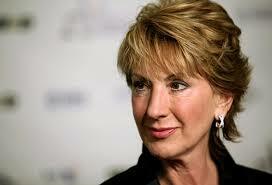 Has too much baggage with her tenure as HP Chief Executive during the Financial Crisis. In Nevada the GOP is about to nominate the weakest Candidate in decades to take on Majority Leader Harry Reid: Sharron Angle. If she wins this we’re screwed here too. I’m all for Businessman Danny Tarkanian now. The NRSC has to be blamed for this Race by not getting popular Congressman Dean Heller to run here. In Colorado the Republican Establishment is still backing fmr. Lt. Governor Jane Norton (R-CO). She has already said some contoversial Comments and will do so time and time again. 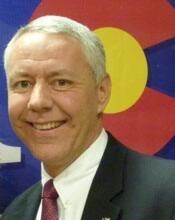 I’ve endorsed Weld County District Attorney Kenneth R. Buck a couple of months back and I hope he can win this come August 10th. Ah, Daniel…..I can’t help but notice that you have separated yourself from every GOP woman candidate….Including South Carolina’s Haley…..
We’re 9 Days away from the “Golden States” Primaries and a new Statewide Survey comissioned by the Los Angeles Times and the University of Southern California done by Greenberg Quinlan Rosner shows the two Women running in the Republican Primaries holding BIG leads. Are Republicans are about to nominate the weaker Republican Senate Candidate for November? The Survey shows former U. S. Rep. Tom Campbell (R-CA) would lead Incumbent Senator Barbara Boxer (D-CA) by 7 Points while former Hewlett Packard CEO Carly Fiorina (R-CA) would trail Boxer by 6 Points. Time and Time again I said that the GOP would only have a shot with Campbell as a Senate Candidate against Boxer. I WAS RIGHT spot on. Mark my words: If Fiorina wins this (as it looks now most likely) it’s GAME OVER for Republicans in the California Senate Race. Daniel…..California Senate: Another Field Poll SHOCKER; CA-SEN Race now a Toss-Up; Campbell edges ahead of Boxer; Campbell also ahead in the GOP Primary by 6 Points…..
One Day after Field released their Governor Polling showing Whitman ahead of Brown by 3 Points they now have Numbers today for the Senate Race showing former U. S. Rep. Tom Campbell (R-CA) edging out Democratic Incumbent Senator Barbara Boxer (D-CA). 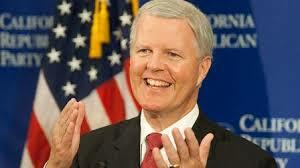 Campbell also leads the Republican Primrary by 6 Points over former HP CEO Carly Fiorina (R-CA). The CA-SEN Race is now a TOSS-UP. 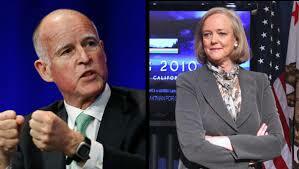 If we said to Democrats a year ago “Hey, we can make CA-SEN competitive” we would have been called STUPID. 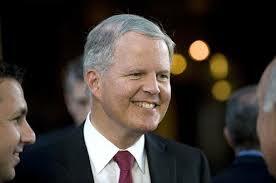 In the last 4 Polls Campbell and Boxer are within 4 Points of each other. I expect some of the Political Handicappers in DC to move this Race into Toss-Up. The Real Clear Politics Average shows Boxer ahead by 2,2 Points. I think that’s close enough to move it. The Pollster.com Average has similar findings. Guess what who is coming: Yes, the President. While the Dog will once again hail his vist I’m sceptical this will help the Incumbent. Presidential Visits to California are RARE when it comes to Elections. It’s usually not a good sign if the Democratic has to come for the Rescue in a Deep Blue State. He, he, he…..we have eight months to go…Obama usually goes to Cali to raise money…..they all do…. 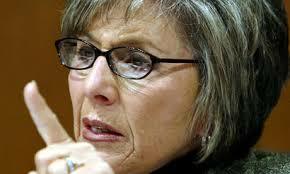 I also don’t like Boxer…..
Daniel…..California Senate: Could Senator Barbara Boxer (D-CA) lose her Senate Seat; Have the Republicans finally found the 10th Senate Seat to take over the Chamber? Democrats getting into precarious Situations even more. After an R 2000 / DKOS Poll indicated California Senator Barbara Boxer (D-CA) might be in serious Trouble another Pollster confirms it now showing Boxer ahead by only 2 Points (R2000 had her ahead 47-43). At the beginning of the Cycle this would have been impossible to think. With that in mind I’m beginning to think the following: Have Republicans finally found their 10th Seat to take over the Senate? More Analysis later. 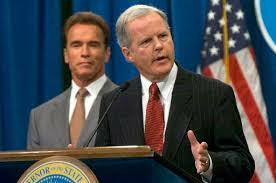 Despite bad Approvals I don’t Arnold has hurt Republicans (as the Dog claims over and over again). This Race is now a TOSS-UP and mark these (my words): If Democrats are losing the California Senate Race come November they’ll lose their Senate Majority too – GUARANTEED.